(AP) BAGHDAD - Iran and six world powers exchanged dueling proposals Wednesday in a tug of war over Tehran's nuclear program that pits international concerns about the Islamic Republic's potential to build atomic weapons against enforcing crippling sanctions on its people. The daylong back-and-forth in Baghdad focused largely on whether the current enrichment level of Iran's uranium production is a red line the U.S. and other powers will not permit for fear it could become warhead-grade material. Western negotiators presented a package combining new and old proposals offering Iran medical isotopes, some nuclear safety cooperation and potentially spare parts for civilian airliners. In exchange, Tehran would stop its 20 percent enrichment levels as a first step, according to a Western diplomat involved in the talks. The diplomat spoke on condition of anonymity to discuss the negotiations more candidly. Iran brought a potent bargaining chip to the table, tentatively agreeing on the eve of the negotiations to allow U.N. inspectors into a military complex suspected of conducting nuclear arms-related tests. The gesture was an attempt to head off painful July 1 sanctions on its oil exports to lucrative European markets. U.S. and European measures have targeted Iran's oil exports - its chief revenue source - and effectively blocked the country from international banking networks. But diplomats from the six world powers refused to considered the sanctions as a relevant part of the impasse. A member of Iran's negotiating team, who spoke on condition of anonymity to discuss the sensitive talks, predicted negotiations would continue Thursday. The talks are seen only as a small step forward in a delicate negotiating process that likely will unfold over months. That would likely bring objections from Israel, which claims that Iran is only trying to buy time to keep its nuclear fuel labs in full operation. But a delay could allow U.S. and European allies to tone down threats of military action - despite calls Wednesday from a hawkish alliance of U.S. senators who urged negotiators to take a hard line against Iran "to leave no doubt that the window for diplomacy is closing." "The Iranian regime's long record of deceit and defiance should make us extremely cautious about its willingness to engage in good-faith diplomacy," Republican Sens. John McCain and Lindsey Graham, and Independent Joe Lieberman, wrote in Wednesday's editions of The Wall Street Journal. "The U.S. must be prepared, if necessary, to use military force to stop Iran from getting a nuclear-weapons capability." The Baghdad meetings opened with the so-called 5+1 group - the permanent U.N. Security Council members, the United States, Russia, China, Britain and France, plus Germany - putting forward a proposal apparently aimed at reining in Iran's highest-level uranium enrichment. Many world leaders fear the uranium, enriched to 20 percent, could quickly be turned into weapons-grade material. Other details of the plan were not immediately disclosed. "We hope the package that we put on the table is attractive to them so they will react positively," Mike Mann, spokesman for the head of the European Union delegation that is leading the talks, told reporters. "It's up to them to react." He also suggested that any rollback in sanctions was unlikely in the Baghdad talks, calling them a "matter of the law and they will come into force when they come into force." Hours later, Iran put forth a counterproposal that includes "nuclear and non-nuclear issues," according to the member of its negotiating team. The official would not discuss details of the plan but said it was to be discussed in private meetings with diplomats from the European Union and China, an Iranian ally. Iran's top officials, including Supreme Leader Ayatollah Ali Khamenei, have repeatedly said that Iran does not seek nuclear arms and have called such weapons against Islamic principles. During a visit to western Iran on Wednesday, President Mahmoud Ahmadinejad evoked Khamenei's belief that "production and use of weapons of mass destruction is forbidden" by Islam. "There is no room for these weapons in Iran's defense doctrine," he said at a gathering to commemorate victims of Iraqi chemical weapons during the 1980-88 war with Saddam Hussein's Iraq. 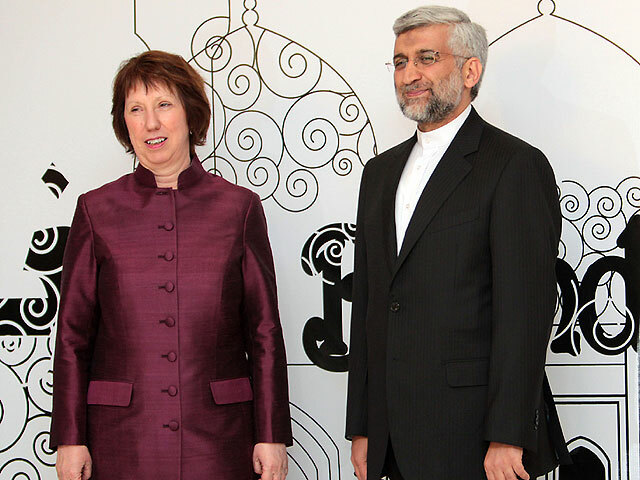 Even so, Iran is sticking to its right to enrich uranium as a signatory of U.N. nuclear treaties. The high-enriched uranium is far above the level needed for energy-producing reactors, but is used in medical research. Iran claims its nuclear program is only for electricity and medical applications. Earlier this week, Tehran tentatively agreed to allow the U.N. International Atomic Energy Agency inspect the Parchin military complex southeast of Tehran. That's where the U.N. believes Iran ran explosive tests in 2003 needed to set off a nuclear charge. Tehran says Parchin is not a nuclear site. Mann expressed cautious optimism about the still-unsigned deal but said it would have little bearing on Wednesday's talks. In Washington, White House spokesman Jay Carney lauded it as a positive step forward, "but we judge Iran by its actions, not by its promises." The Iranian envoys entered the talks sorely wanting to lessen, or at least delay, an EU decision to cut all crude oil imports from Iran that are set to take effect July 1. The 27-nation EU accounts for just 18 percent of Iran's total oil exports. Earlier this week, the U.S. Senate backed proposals for further sanctions on Iran, including requiring companies listed on U.S. stock exchanges to disclose any Iran-related business. U.S. and European measures already have targeted Iran's oil exports - its chief revenue source - and effectively blocked the country from international banking networks. Oil fell to a seven-month low near $91 a barrel Wednesday on hopes of progress in the talks. If the July 1 sanctions start as planned, Iran's Economy Minister Shamseddin Hossein predicted they will backfire, warning this week that Europe should expect a crude oil price of $160 a barrel should the embargo remain in place. That puts a ticking clock on a negotiations process that, for all its bluffing and brinksmanship, may drag on "for several weeks, if not for several months," said Bruno Tertrais, senior research fellow at the Foundation for Strategic Research in Paris. "There will be incentives to not rush toward any kind of deal," Tertrais said.